Kaleidescape has launched a 9-terabyte version of its famously expensive video server range. The Kaleidescape 3U [PDF link] is a three-unit rack-mount design. And it's primarily aimed for multi-room use - handy if you have a network of integrated TVs dotted around your home. Key to the Kaleidescape 3U's massive capacity is the fact that it can take up to 14 disk cartridges, 12 of which are for music and video storage. This gives it a capacity of 1,340 DVDs or 15,000 uncompressed CDs, says Kaleidescape. Or you can string 12 3Us together for a staggering 100-terabytes of disk space. "If an active drive fails, the server continues to operate, no content or user-generated data is lost and information that was on the failed drive is automatically restored to the hot spare." The company says this should eliminate the need to call out a service engineer - handy if your home is a Bond villainesque secret volcano or a boat moored off the Azores. Whether you're at sea or on land, you'll also be pleased by the 3U's ability to serve music and video in up to 25 different locations in your home. 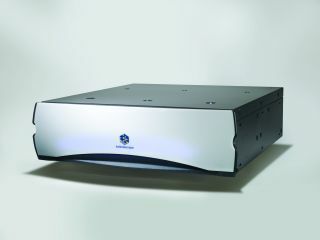 The Kaleidescape 3U is available now for £10,000.